Eugene William Boldt passed away at home in the early morning hours on April 10th after six, hard-fought years against cancer. Looking back, Gene “did it right” (his words). He retired early after a career at DMACC, and built his dream home in Ankeny where he could enjoy nature every day. It was “like living in a tree house”, he often said. In retirement he pursued his passions of art and travel. 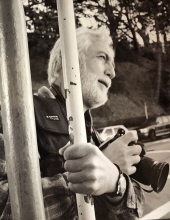 He tried his hand at photography, sculpture, drawing, pastels, and finally settled into watercolor painting. When he wasn’t painting, he was globe trotting. Alaska, New Zealand, Egypt, and Italy were a few of his favorites. One highlight in his later years was becoming a child advocate through Iowa’s CASA program, where in 2015 he was awarded CASA volunteer of the year. Dad, your life touched so many; you will be dearly missed. To send flowers or a remembrance gift to the family of Eugene William Boldt, please visit our Tribute Store. "Email Address" would like to share the life celebration of Eugene William Boldt. Click on the "link" to go to share a favorite memory or leave a condolence message for the family.